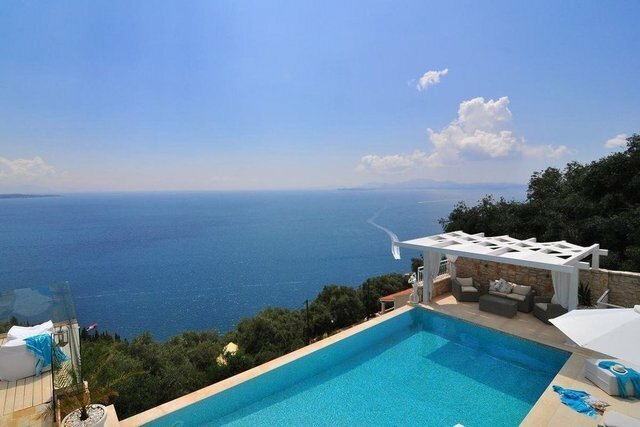 This newly-built villa in the north east of the island in Agni Bay has a stunning position offering magnificent view across the Corfu channel and Albania. The villa has a floor area of 140 sq. metres and features a large living room with fireplace, a modern fully fitted kitchen and a guest bathroom on the ground floor; a few steps up lead to a master suite with jacuzzi and shower room; a few steps down lead to a further two bedrooms, both with patio doors leading to the pool area. This outside area has been well designed to incorporate the infinity pool, patios and a BBQ area and 50 sq. metres of verandas as well as taking advantage of the stunning views. There is also possibility of building a second villa approximately 250 meters.